Today it's All Souls Day, the day the French visit the cemeteries beloved are buried. A couple of appropriate links. Because it's ALL Souls Day, we should not forget those who died long ago. 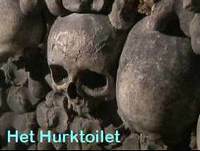 The Catacombs in Paris form a huge underground ossuary. A small part of it is an aofficial museum you can visit legally. Most of it is closed formally, but adventurers come in every day. Something completely different is the famous cemetery of P�re Lachaise. Oscar Wilde, Edith Piaff and Jim Morrisson are here to find, among many other celebreties. However, not everyone comes here to see graves. Couples visit this grave-yard just for a romantic walk. The place is favourite spot for bird watchers too. Last but not least, some women had a good time leaving traces on the statue of Victor Noir.